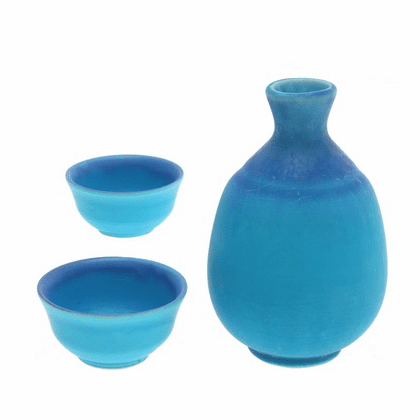 Matte turquoise & blue ceramic sake set. Bottle is 3-1/4 inches in diameter and 5 inches tall and and holds 9 ounces. The two cups are each 1-3/8 inches in diameter, 2-5/8 inches tall. They hold 2 ounces each. When you drink be sure to say "Kampaii!"